I could have kept going and going, but I’m not quite sure where in the Baltic I’d have ended up. It was great to just go out for a sail in the new boat. 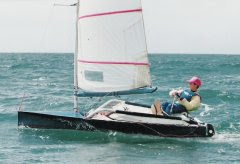 No racing, no marks to go around, just me foiling around in hardly any breeze. I managed to sneak out this evening for a superb light wind evening sail. I drifted out wondering if this was really a good idea or not, but lifted out in a little puff off the marina wall, and cruised passed some RSX’s at over 15 knots while they were flapping around trying unsuccessfully to get planing. I spotted two F18’s off in the distance and thought they’d make a good target as well. I got to them, gybed around their sterns and found out one of the boats was being sailed by the Sachs brothers who I used to race against in Tornados. They are one of the best in the world in the F18 so it was satifying to then cruise through to leeward off them upwind, and then tack and cross them. I’ve done that to F18’s in 15 knots, but it was cool to do it in 8knots. British Mothies take 1,2. In a tough shifty final day in 5-20 knots, Gary and I climbed up the rankings to move passed Sven Kloppenburg to take the top spots. I managed a 3,1,1 to win the series. It was incredibly patchy and shifty, with a lot of lead changing so I was pleased to survive the shifts. 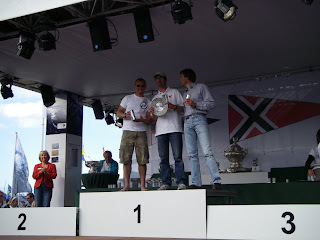 Gary Ireson sailed well to get second, and it was fun to be on the podium with him. A few salutes to the cameras, and a high five to finish got a few laughs from the crowd. All in all, Kiel week has been quite a success for the Moths. The organisers have invited us back I think, and the German association are thinking about proposing Kiel as a Europeans next year. So now onto the Worlds. 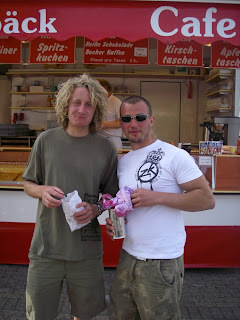 Firstly I’ve got coaching commitments out in Kiel with my 2.4 squad. It is the last event before China so an important one in the programme. I did a few fly-bys passed some of th 2.4’s out training while I sailed in after racing, and now many of them call me the ‘Flying Coach’, which has become my radio call sign this week. Then it is back home for me for a week of sailing before the Worlds start. I’m happy that I’ve got a few more gears left in the new boat. 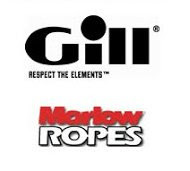 I haven’t pulled out the MSL13 and 40mm mast yet, they are to be tested against Gary in our evening training sessions here in Kiel. A new boom, spreader prodder unit, and rigging will loose another 1kg from an already light package. A tidy up of the foils and a bit of wet and dry over the hull to improve the 120 grit and one coat of lacque finish that was all I had time for on route to here, should also help! 30 knots for most of the day today so no racing. So I’ll post some pics from during the week. Okay I shouldn't have mentioned about using up discards! Doh! Broke part of my kingpost today in the first race whilst leading and limped home with no kicker on to get a result. Painful watching the fleet cruise by, and an interesting exercise on how low you can point upwind when you don't have any kicker on! I sat out the next one to get it all sorted. All repaired now and I live to fight another day. But all in all it was a good day. Pace is very good in the marginal stuff. I'm first to foil, and can foil for longer. Still plenty of little tweaks to do, but happy to be quick out of the box. Our first race of the day was actually abandoned in the end because the breeze died completely, but I lead round the top mark being the only one to manage to foil up the beat, with the Skippy 'All the Way May' in second. The Skippy got into the lead on the lowriding reach, and Mark Robinson got me on the second one. (Note to self - get some more peel ply to finish deck grip so I can sit fwd in the light stuff!) But I foiled through to leeward of him on the second beat. Prompting a bit of mainfoil tweaking with the rubber mallet later on! Gary peaked early again taking a win in the first counting race, and then struggling in the second of the day. Alex Adams decided to try his standard rig again, but still couldn't find speed and control from his boat, so came in to ponder life, the universe, and german sausage. The Moths have been a big hit here with lots of interest from the organisers and spectator boats, and I heard this evening that although this was meant to be a single invite event, we might be invited back next year. Whilst we were packing up, and most of the other fleets were sailing home a huge thunderstorm came over, with loads of breeze under it! Almost everything still on the water capsized, and tents ended up in the marina! Ten minutes later it was sunny again! That'll be Kiel! But its growing on me, now I know it is always like this. Well I guess that counts as a successful launch. The boat hit the water for the first time this morning, and then I managed to win all three races today. Quite happy with that really. It was a windy day here in Keil, but the sun was out. Off the land it was gusty and shifty. Not exactly what I wanted for launch day. And to make matters worse we had three races scheduled as the forecast for Mon and Tues is really bad. So much for a chilled first day possibly using up my discards while I got sorted. The first race was breezy with gusts in the high 20's on the committee boat apparently but some pretty light patches thrown in for fun. 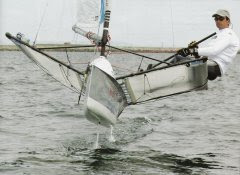 The average pressure slowly dropped during the day and the last race was almost marginal foiling. Race one: Mark Robinson and I tried to port tack the fleet - Mark made it, I took a few transoms, but I got round him to lead round the first mark. He then managed to rip his rudder foil off his Bladerider, and had great fun trying to sail back to collect it! Gary Ireson then took up the challenge for the lead. He got passed me for a lap or so before pitchpoling on the top reach to hand me the gun. Race two: I'd tweaked a few settings and was happier with my set-up for this one, with just a little bit on the main cable she was much happier upwind, and we launched off the start to lead round the top again and sail away from the fleet. I'm afraid I don't know what happened behind, as we managed to extended quite early and then lost sight of most people amongst the Europes and lapped boats. Race three: Mr Robinson was back out and we thought we'd play at the Port end again. Not so pretty this time and we ducked the fleet and sailed into the right while the leaders came out of the left. I got round in third and chased down the two German Bladeriders ahead. I took out the first on the top reach, and halved the distance to the leader on the bottom reach, to then get passed up the second beat. I managed to extend nicely on the run and get away to a nice little lead. 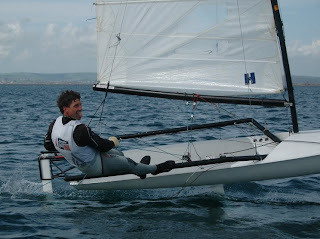 Sven Kloppenburg came through the fleet well to get passed Mark for second, which puts him in second overall. All in all pretty happy with day one in the new ship. 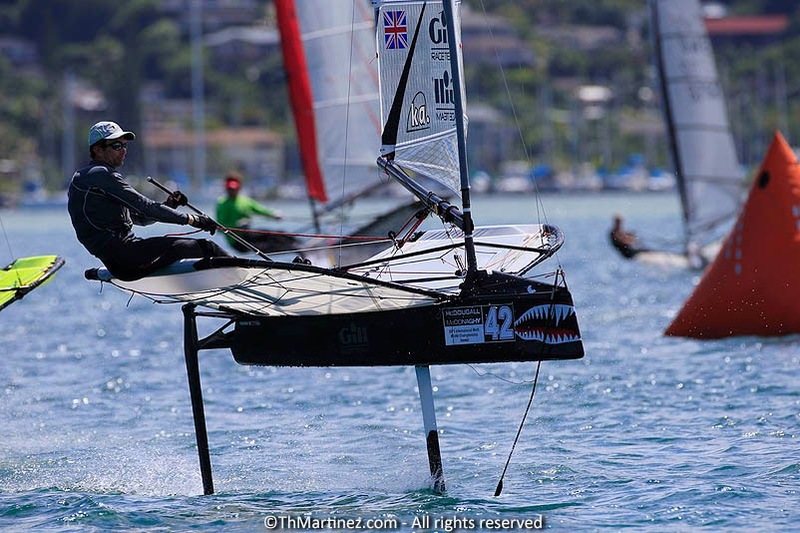 In other news here, Alex Knight almost managed a great foiling tack but seemed to be ejected from the boat mid turn, which unfortunately his tiller didn't survive. 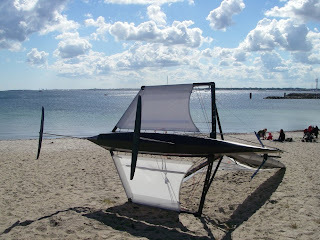 Team Estonia didn't have a great day in their new Bladerider either, with a broken main foil. I think another has been sourced though as I spotted a bit of evening training going on. Better dash, and catch up with sleep following a tiring build followed by drive. Finished! 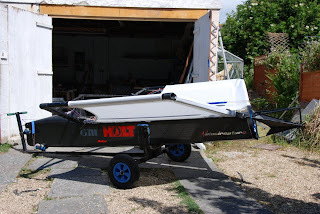 New boat all complete and about too be put on the trailer to head off to Kiel. Very happy with it. Definately the best Moth I've had. Dave did a great job getting the primary structure done for me, and its been in my workshop for the last few weeks being finished off. 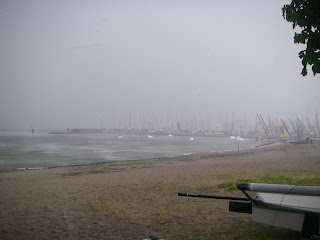 Blowing a gale here for the last two days so looks like I'll be launching straight into the first race of Kiel week. 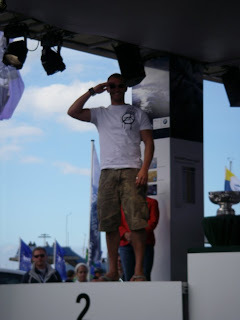 Oh well it will all be good practice and nice to be sailing again. Funny that the Aussies have already sent their boats over here, and I'm about to launch - great prep again! At least this time I've had my test pilot busy on his secret test lake, and Katherine has progressed to pro Moth builder in record time to help me get this far. 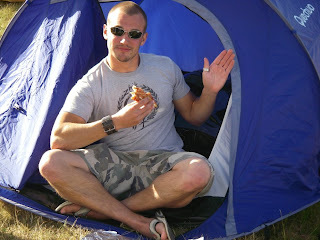 Should have good internet access in Kiel so will get up to date with my blogging. New boat almost done. Manic few weeks but I might just launch before driving to Kiel! Pics when the rain stops! Whilst out in a rib checking out 2.4 sails yesterday I got to see Alex Adams new Moth close up for the first time. Enough people have seen it now, and it got a DailySail mention recently as well, so I think I can chat about the wingmast. Linton developed this mast for a Merlin Rocket many years ago with my old National 12 helm Kevin Driver. We'd always talked about how it would be interesting to try on the Moth so a few years ago I got hold of one of the masts from Kevin and brought it back down to Linton's. We rigged it up on my Mistress 1, and thought it had potential, but general Moth development takes time and it always got sidelined. Linton got hold of another one ready for testing, but they sat outside the workshop for a while. I found an old photo of us looking at it rigged up for the first time exactly 3 years ago! - Oh my god how time flies! By winter 06, Alex Adams had taken the most interest in it, and did a few mods to his boat to fit it. We'd talked of it being the 'Garda project' but new foil development came first. 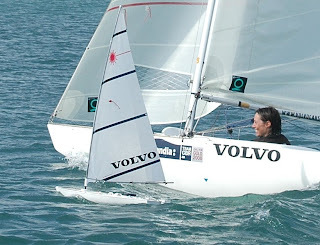 So it was then 2007, and I was out of the loop playing with America's Cup boats in Valencia. Alex and Linton had clearly decided to continue to pursue it, and ideas for Alex's new boat this year evolved around the use of the mast. Would be great if it does work, I love to see development like this going on but I think there is still a lot of development to do yet. 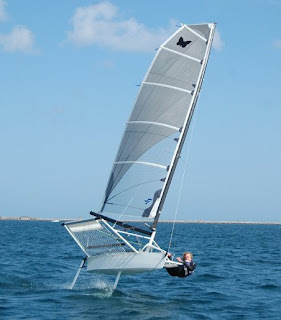 Oh and Linton's latest foiler - a more of a foiler for the masses was also out yesterday evening. I didn't get any pics of it foiling, and few details are known about it yet so I'll save that for another post if I can find the time. Paul goodison was also out 'training' with his model Laser, and Helena decided to take him on! Stupidly busy. Should have always predicted as much it is an Olympic and Paralympic year. Doh! Oh well, the 2.4 coaching is going well, and the GBR team as a whole were top nation at our unofficial test event in China. We've got Helena's new boat on the water, and have been getting that up to speed. As a result I've got a fair bit of 2.4 sailing in. Did another open in Poole the other weekend, in which I finished second to Megan Pascoe from our squad. 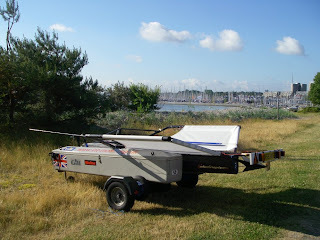 I collected my new boat from Dave the other week, who'd moulded the prepreg hull, and assembled the foredeck, and wings. I then brought it down to my workshop to finish off, after we had an amazing thunderstorm in the early hours of the morning! The boat is looking good. Weight is very good, and its very stiff. Aimed to get it done for the nationals, but I've got coaching commitments this week, and it looks like I'll be measuring boats for most of Friday so I won't rush it, I'll get all the nice details right and launch next week. 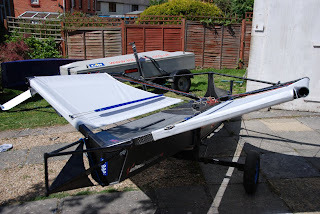 So the M3v gets back on the water if I can find all the bits! Will be good to catch up with everyone as its looking like a good turnout.